Organizers behind the Women's March, an anti-Trump and female empowerment protest, called for a 17-minute walkout on March 14 to "protest Congress' inaction to do more than tweet thoughts and prayers in response to the gun violence plaguing our schools and neighborhoods." On Monday, while much of the federal government observes Presidents Day, a group dubbing itself "Teens for Gun Reform" planned to stage a "lie-in" for gun reform outside the White House in Washington. The Network for Public Education, an advocacy organization for public schools, meanwhile, announced a "national day of action" on April 20, the anniversary of the 1999 shooting at Columbine High School in Colorado, in which two students opened fire on their classmates, killing 12 students and one teacher. 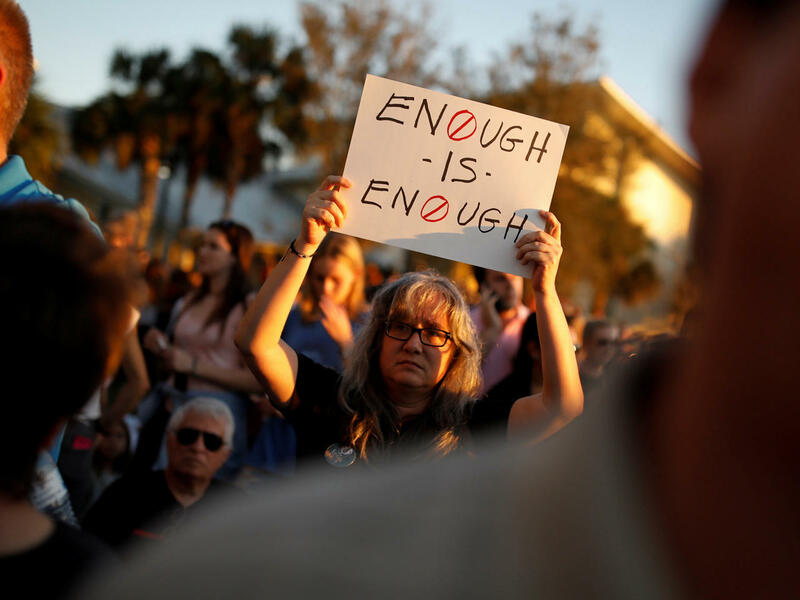 "The politicians sit on their hands as our children and their teachers are murdered in their schools," Diane Ravitch, the group's president, and Carol Burris, its executive director, said in a post online. Thousands gathered at a gun control rally in Fort Lauderdale, some 25 miles from where 17 people were shot and killed at a high school this week. Students spoke passionately during Saturday's rally pleading with lawmakers to change gun laws. "We need to make this moment a movement and to actually make changes that need to happen in this country so that these kinds of weapons, AR-15s, are not in the hands of people who shouldn't have them," said Randi Weingarten, president of the American Federation of Teachers, a union representing teachers and other educators. Teenage survivors of Wednesday's shooting at Marjory Stoneman Douglas High School have become advocates for gun control, sparring with gun-rights activists on social media and calling for safer gun laws at vigils and in television interviews. Students also shared their plan to hold a march on Washington next month under the banner of a new group called March for Our Lives. Speaking to CBS' "Face the Nation" on Sunday, one student of Stoneman Douglas said they hope to spark a national movement. "March for Our Lives has support from everybody. And at the end of the day this isn't a red and blue thing. This isn't Democrats or Republicans. This is about everybody and how we are begging for our lives and we are getting support. But we need to make real change here and that's exactly what we're going to do," said Cameron Kasky, a student of Stoneman Douglas. Some people in online posts called for a Civil Rights-era style boycott of schools until gun laws are changed. David Berliner, a professor of education at Arizona State University who also participated in the plans for the April 20 protest, said he would support such a boycott. He recalled watching a television news report about Wednesday's shooting at an airport. "I'm crying, and I'm watching all the people all around me crying, and I just said, 'This has got to stop,'" he said. "President Trump talked about the American carnage in the United States. This is the American carnage," she said.